I’m on my way home from Washington DC to Atlanta. The last few days have been quite eventful. We arrived on Wednesday night and got right into rehearsing. It wouldn’t be N7 if we didn’t wake up everyone on our floor at 10pm at night. (We always think we are softer in volume than we are). Thursday morning we were up bright and early for a “Civil Rights Pioneers Luncheon”. We performed “Ready or Not” in a huge space much larger than we expected. It was quite hard for James (our sound engineer) to get control of the sound. I wish you were there! What a nice moment! I wish I could paint that picture. Wait a minute: as I recall, I saw two video cameras from our camp, so I’m sure you’ll see it somehow and soon :-). The line up for the night at the Washington Convention Center included N7, Anthony Hamilton, India Arie, Patti Labelle, Eddie Levert, The Impressions and many more. We performed “What the World Needs Now Is Love” for the first time and it went down pretty nicely. Just before starting the show we received the news that confirmed the rumors from the day before: the Sunday ceremony was to be canceled. Wow! Really? What about the bus loads of people already here and the ones on their way? What about the huge amounts of money poured into the cost of this celebration? Can’t we move it to Friday? Can’t we do something? Well, you know the answer… Hurricane Irene has spoken. This didn’t make us give any less in our performance the next night at the Kennedy Center. In fact, I think it made us give more (if that’s possible). 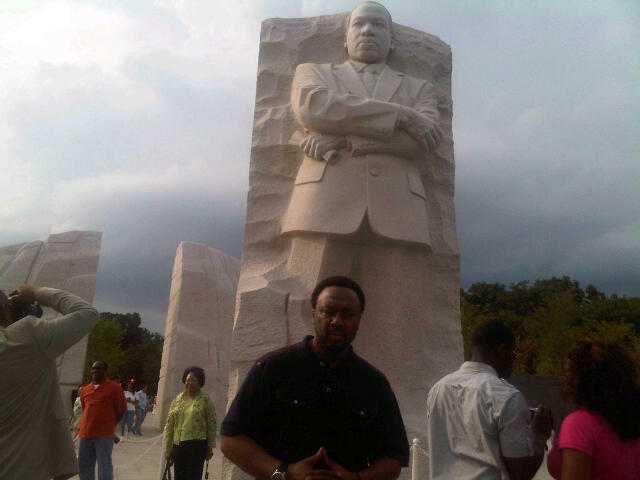 Right after an afternoon sound check with Frederic Yonnet and his band, which became a full out jam session, we decided to visit the MLK Memorial. This turned out to be the perfect thing to do before doing the “MLK Memorial” concert. I had seen a few images of the sculptured rock of this great man, but it still didn’t prepare me for the real thing. It was fitting. It appears to be a stone/rock that was cut out of the mountain behind it. On the side it reads; “Out of a mountain of despair came a stone of hope.” It was beautiful and truly inspiring to do the concert afterward. We performed “Jericho”, “Bless This House” and ended with “Wall of Sound”. The finale was a duet with Fred Yonnet (also the MC for the night) with band and us. We started a cappella and he then joined us half way through the song with his harmonica. His full band joined us on the vamp out and it was exciting and powerful! A great way to end the evening. Now that I’ve actually reached home, all I can do is pray that Hurricane Irene is less than expected. I have one brother and sister left in New York, so I’m concerned for their well being. We’ll now see what happens. Let’s all pray the best! Thanks for the update. I had heard you all were going to be in DC on Sunday, but was unaware of the other dates. Please direct me to a more inclusive calendar. I do not want to miss another performance. P.S., Tell Dwight that I am glad that licking salt seems not to be an option for either of us and that I love him! almost bought a ticket fir that jazz cruise out of Miami, but I would of had to rob Peter to pay Paul to do it. I was in Washington from 19 to 29 august and I didn’t go in Kennedy center because of Hurricane. But i thinking of you a lot ! My heart was with you. I was at the Kennedy Center performance and enjoyed you guys so very much! I was also glad to see that a video clip of you and the other performers is available at the Center’s website: http://www.kennedy-center.org/explorer/videos/?id=M4764&type=A — you start at the 21-minute mark. The last song was so exciting!! !